Anyone can experience drug and alcohol problems, no matter what their background or personality, but many professionals may find themselves exposed to drugs and alcohol in very regular circumstances. Business lunches, client dinners and perhaps the culture of a specific workplace can all create many opportunities for excess and addiction if someone is predisposed to it. 17% of kitchen staff and chefs use illegal drugs, mainly due to the stress of a professional kitchen environment and the temporary nature of many jobs in this sector. The second most frequent users of illegal drugs in the workplace are those in the construction sector, at 15%. It’s becoming more and more common for construction firms to introduce drug tests for their staff because of this. 12% of the sports and entertainment industry use illegal drugs – cocaine and crystal meth being particularly popular. Anabolic steroid use is common in the sports industry for its performance enhancing properties. Like the restaurant industry, sales is known for its stress and pressure. 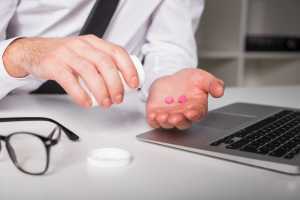 10% of professionals in sales use illegal drugs, and the study also found employers all too willing to turn a blind eye. “Doctor shopping”, or getting multiple prescriptions from different doctors. Hiding medication and keeping it in secret places. Becoming irritable when friends or family ask questions about the medication. Looking forward to the next dose or feeling anxious if it is not immediately available. You have considered your life might be better if you didn’t drink alcohol. You regularly continue to drink even if it makes you feel ill, or you have already been drinking for a long time. Others have commented on the amount that you drink. Your drinking has made you feel guilty or ashamed. You turn to drink when feeling emotional, stressed or low. Many professionals who come to us are initially concerned about confidentiality and keeping their addiction private. This is one of our primary concerns for all patients, but we understand that certain industries and high powered executive positions put people in more sensitive situations. All of our staff are highly trained to provide personalized, dignified and sensitive treatment to everyone in our facilities. We take confidentiality extremely seriously. There are a number of options for treatment, including inpatient and outpatient care. Outpatients can come to the facility regularly, still maintain their responsibilities and roles outside of rehabilitation, and not arouse any suspicion amongst their colleagues, associates or friends. Outpatient care can include the majority of the same elements as inpatient care, including group therapy, one-to-one psychological consultations, art therapy, yoga, physical therapy and addiction education. Outpatient care is not always suitable, however. Those who have already relapsed or are presenting severe addiction and withdrawal symptoms will need to be fully supervised and would benefit from inpatient treatment instead. We are a state licensed and accredited facility and have spent years cultivating a safe and peaceful environment for our patients, whether they visit us regularly or stay on a residential basis.